Michael McFadyen's Scuba Diving - TSS Belbowrie The TSS Belbowrie was built by R. Davis at Blackwall, Woy Woy, Brisbane Water on the NSW Central Coast. The Davis family was a famous shipbuilding family in the Central Coast area from 1848 till 1913. This shipyard was established by Rock Davis and built at least 168 vessels. The biggest was 277 tons gross. Rock Davis died in 1904 but the yard continued to operate till 1913 under the management of W. Davis and J. Cameron. Launched in 1911, the Belbowrie was 37 metres long and displaced 218 tons. I am pretty sure that it was built from timber. Built for J. Weston, the vessel was powered by two two cylinder steam engines manufactured by Mort's Dock and Engineering Co Ltd, Balmain. In about 1914 the vessel was sold to Coastal Shipping Co-operative Co Ltd and the next year to the Coffs Harbour Co-operative Steam Ship Co Ltd.
On Tuesday 20 April 1915 the Belbowrie passed Gabo Island just south of the New South Wales/Victorian border heading to Melbourne. On Saturday 24 April 1915 she left Hobsons Bay (as Melbourne appears in early shipping reports) for Sydney. On 22 March 1916 the Belbowrie arrived in Sydney from Port Pirie in South Australia. On Wednesday 23 August 1916 she arrived in Sydney from Coffs Harbour. 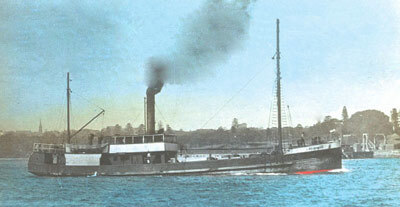 In August 1917 during the NSW mine strike, the Belbowrie was one of the 29 coastal colliers commandeered by the NSW Government. It is not clear if she had been used as a collier prior to this. Also taken over were the Tuggerah, Undola, Myola, Hall Caine, Galava and Duckenfield. There was problem getting crew to man these ships. On Thursday 20 December 1917 the Belbowrie left Melbourne for Sydney. On Saturday 27 April 1918 the Belbowrie departed Sydney with a load of timber for Melbourne, arriving Monday afternoon. She was to return with general cargo from there on Wednesday 1 May 1918. Shealso left Melbourne on 7 May 1918 and I assume that this was the next voyage. On 4 June 1918 she arrived in Melbourne (Hobsons Bay) from Sydney. and in the early 1920s ownership changed again to Kirsten and Earnshaw Ltd (I am not sure of this as the entry in Lloyd's Register of 1924-25 that I checked is crossed out). As well as having a few (heaps in fact) owners, the Belbowrie had a few incidents in her life. On Monday 25 June 1923, the Belbowrie left Red Head near Ulladulla to travel to Sydney via Sussex Inlet, She was carrying 25,000 feet of timber. The weather was bad and Captain H. Chamberlain decided to miss Sussex and go straight to Sydney. At 4.30am on Tuesday 26 June 1923, the TSS Belbowrie ran aground on Wanda Beach about five and a half miles north of Cronulla on Sydney's southern outskirts. There was gale force south-easterly winds and very heavy rain. Somehow the Belbowrie either travelled between the mainland and Jibbon Bombora or around the bommie and then headed right into Bate Bay and, I assume, rode straight over Merries Reef (which must have been breaking) as where it ended up, the reef is on a straight line from anywhere south! 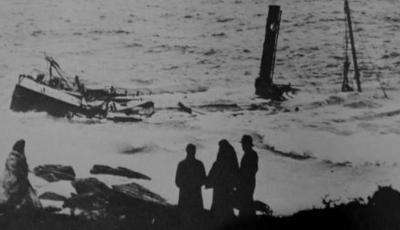 After removing the timber to the beach, the Belbowrie was refloated on Sunday 2 July 1923 with the help of the lighter Zelma. The ship sailed to Sydney and was found to have suffered no damage. An interesting aspect is how the timber was removed from the beach when it is considered how far this spot was from the nearest road or track! In 1923 or 24 sold again to Shoalhaven Steam Ship Co Ltd, although a report in the newspaper about the incident in the next paragraph says the owners were Kirton and Tarnshaw Limited. 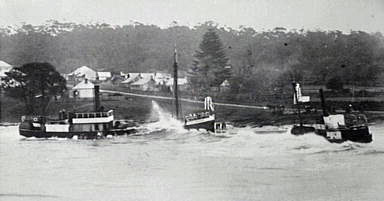 A photograph I found (shown above) was captioned to say that the ship also ran aground in Ulladulla Harbour. From the photo it appears that it was at least partially filled with water. However, I think that this may have been the incident in the next paragraph. On the afternoon of Wednesday 4 March 1925, the Belbowrie was leaving the Clyde River with a load of 40,000 to 50,000 feet of timber under the command of Captain M. C. Black with 12 crew aboard. The Clyde River is the port for Batemans Bay. As she crossed the bar, the ship went outside the channel and ran aground. There was a heavy sea running and the papers reported that there was a fear she would break up. It appears the ship was refloated on the Thursday. In mid-February 1926 there was a large maritime strike, with most vessels in at least NSW out of action as the crew went on strike, presumably for more money. On Tuesday 2 March 1926 the Belbowrie's crew went on strike. However, the next day she was able to depart Sydney for the NSW South Coast with a volunteer crew. Shortly after 10 am on Sunday 5 September 1926 the Belbowrie (stated in the papers to be a collier) was heading past Peacock Point in Sydney Harbour (I have no idea where this is as I have never heard of it). As she passed the point, she ran into a tow line which a fishing launch was a towing a row boat. The launch and the rowing bout were capsized and the launch sank. Four "Italians" in the launch were thrown into the water but were rescued. The occupants of the launch weie - Antonio Lesida aged 30 years, his brother Dominic Lesida aged 24 years, Dominia Bornato aged 35 years and Antonio Costo (? ), aged 26 years. All resided at 33 Croas Street, Drummoyne. The men were fishermen and partners in the ownership of the launch and dinghy which they used for fishing. In 1928 she was again sold to A. Auland. On Wednesday 25 September 1929 the Belbowrie left Sydney for Bellambie. This indicates that she was still being used as a collier. On Tuesday 24 February 1931 the Belbowrie was leaving the Shoalhaven River after visiting Nowra when she ran agound somewhere near the Crookhaven Heads breakwater (this is at the entrance of the Shoalhaven). She was said to be on an even keel. I am not sure what happened next, but she obviously got free. On about 1932 onto Aulco Pty Ltd of Bond Street, Sydney. The Register of Australian and NZ Shipping of 1937 gives the owner again as A. Auland (presumably associated with Aulco P/L). On 24 November 1938, the Belbowrie rescued two fishers off Norah Head on the NSW Central Coast after their boat sank. Less than two months later, the Belbowrie was to suffer the same fate. At 7pm on 16 January 1939 she departed Balmain in Sydney Harbour with 10 crew to travel to Shellharbour to take on a cargo of blue metal. By 8.10pm the Belbowrie had left the harbour and at 8.50pm was off Ben Buckler (the northern headland of Bondi Beach). It was poor weather, with a strong southerly wind and very heavy rain. 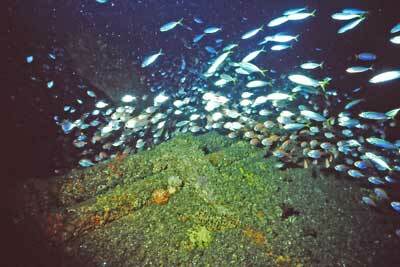 Despite this, it was reported that the seas were not exceptionally rough and apparently nothing undue could be seen. The Captain, Mr P.R. Dixon, went below as he thought they were well out to sea. Edgar Charles Ladd (41), the Mate, was left in control and the Belbowrie was travelling at 6.5 knots. Mr Ladd reported that at first he thought that he could just see white-caps on the sea through a break in the weather but this was not correct. He then realised that what he could see was rocks ahead. All of a sudden, the vessel crashed onto rocks as Captain Dixon lay in his bunk. The Captain thought that they had hit a heavy sea but then realised they had hit the shore. Captain Dixon rushed to the bridge and found they were hard on the rocks at the southern end of Maroubra Beach. He ordered the engines to be reversed but after a few minutes the engine room was flooded and all was lost. Waves were breaking right over the Belbowrie and the ship was already breaking up with its back broken. Captain Dixon fired off a dozen rockets but the last one would not go off. A lifeboat was lowered but the seas flooded it. By now people had arrived at the scene and the Belbowrie's crew attempted to get a line to shore. After several unsuccessful attempts, the line was tied to a buoy. One of the people on shore, Keith Tracey, risked his life by rushing into the seas on the rock platform and the rope was held secure by a squad of Police. The crew then went hand over hand the 60 feet across the boiling seas and rock platform to safety. Only one person was injured, one of the two fireman, John Joseph Duffy of Balmain, who hurt himself when he fell from the vessel. The last person to leave the ship was, of course, Captain Dixon. He became exhausted when travelling down the rope and he fell into the surf with a cry of "I'm done". Luckily, a number of men dashed into the seas and dragged him to shore. Apparently Captain Dixon put his failure to make his way down the line to the fact that "...I'm so fat, that's why I fell off". The crew was transported to Maroubra Ambulance Station where they were warmed up and treated for shock. Within a few hours the stern of the ship was below water and by the next morning the vessel was declared a total loss by Captain D.W. Gibson for the underwriters. She was valued at 6,000 pounds. On Wednesday 22 February 1939 in the NSW Supreme Court, Judge Markell of the Marine Court of Inquiry said that it was unable to decide the cause. He said that no negligence could be attributed to the master or the mate and he directed that their certificates of competency be returned. The Court found that after the stranding the master had taken all proper steps to preserve life and property. 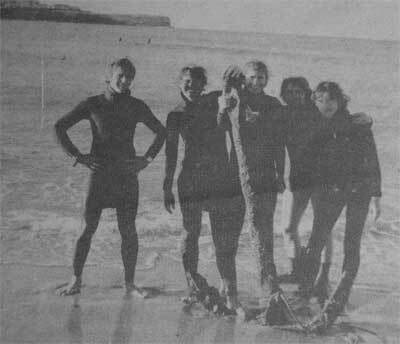 A few days before 4 October 1972, a group of young divers led by Noel Hitchins, then of Maroubra and later the founder and long time owner of South West Rocks Dive Centre, salvaged two anchors and some lead and brass fittings. Noel (who died in early 2005) was a good friend of mine and another of the group was Phil Short, another good friend and someone who I have dived with regularly over the years. They thought at the time that these were from the wreck of the sailing ship Hereward which sank on Maroubra Beach during the "Maitland" storm on Thursday 7 May 1898 and this is what was reported in the local paper. 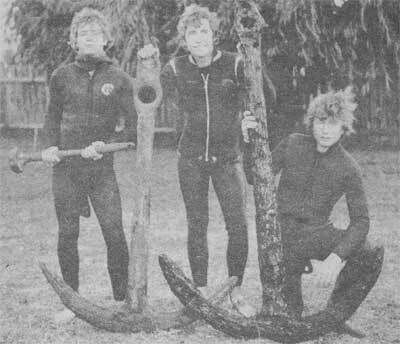 During some discussions with Phil after Noel's death, I thought that the anchors probably came from the SS Tekapo as he said they were salvaged from Magic Point, the south-westernmost point of South Maroubra. Phil reports that they attached a 44 gallon (200 litre) drum to the anchors and filled them with air. The drum and anchor came free from the sand and launched itself into the air once it surfaced. However, in October 2016 I found a photo of another anchor salvaged from the Tekapo which is more than double the size of these anchors. Therefore, I now believe that the above anchors are from the Belbowrie. 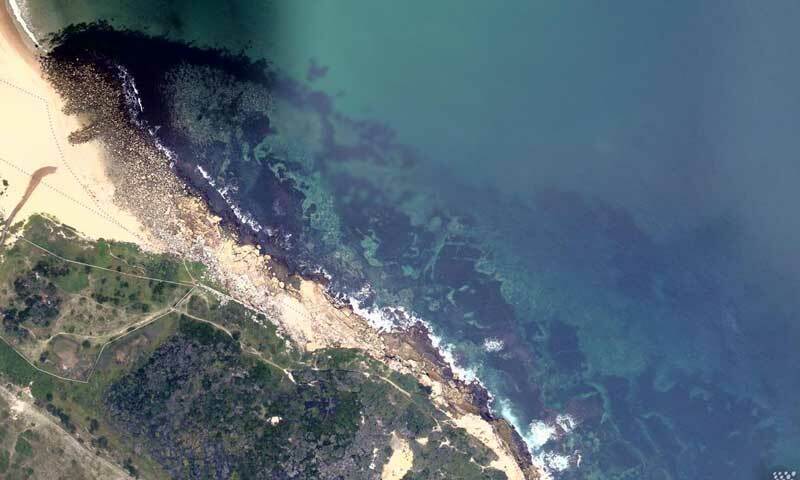 Today there is still wreckage to be found in the area, although very little is identifiable as specific parts of either this ship or the nearby wreck of the SS Tekapo. There are iron plates and girders all over the place, as well as some brass pieces. Some of this may be from the Belbowrie. 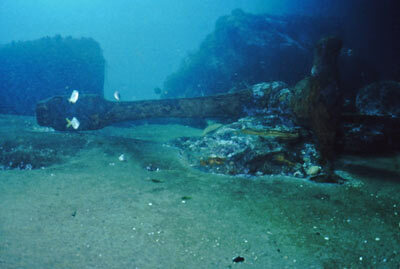 For more details about the shipwreck site, see my article on South Maroubra. This is a Sydney shipwreck that will not really reward the diver with much wreckage, but it is an interesting dive anyway. NOTE: Above photos taken in 1992 using Nikonos IV-A and scanned 2011 from slides.